Description: This is a 3 mile moderate loop in the SNP. If this hike was 2 miles longer or done in conjunction with the Rose River/Dark Hollow Loop also described on this site I would probably considerate it to be strenuous. It includes a couple of great viewing platforms along the Lewis Falls Trail, one along the AT at Black Rocks and spectacular Lewis Falls. If you follow the route as described you will descend gradually over a 1.5 mile distance and have to climb the same distance (Some of it steeply at the rate of 500 ft/mile) on the return. If you are short of time but really want to see the falls park at the Byrd Visitor Center and walk south, paralleling Skyline Drive to a small picnic area with a hitching post just on the other side of the southern most entrance to Big Meadows. (You’ll walk past a gas station.) There you will find a concrete post directing you to the Lewis Falls Trail. Remember that one has to climb whatever he/she descends. 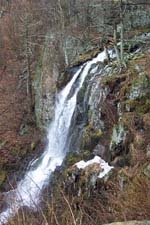 The best time to view the falls of SNP is in the spring, just after ice out or a long period of rain. Trail Notes: From the amphitheater take the spur trail on its left down to the AT. Turn left onto the AT and in about .09 nine miles arrive at the junction with blue blazed Lewis Falls Trail on the right. 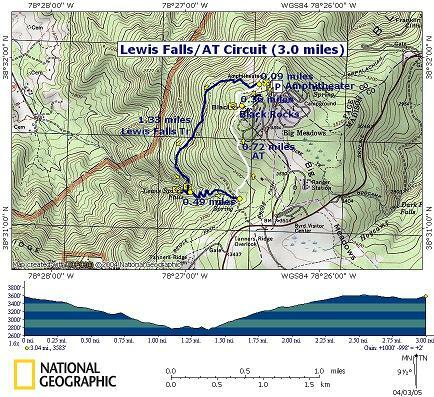 Take the Lewis Falls Trail. At first the trail is easy to walk but as you get closer to the falls it becomes much rockier. Near the end you will have to walk over a couple of large boulders. In 1.3 miles arrive at the falls spur trail straight ahead. Follow it, crossing the stream as you descend to the viewing parapet. A handrail has been installed to assist you should the rocks be slippery. After viewing the falls return to the junction with the main trail. Turn right and ascend steeply for about 0.5 miles. The trail switchbacks up the side of the mountain and then widens into a gravel road. From this point walk another 70 yards, passing an enclosed pumping station on the left, to the junction with the AT. 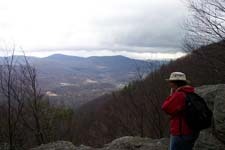 Turn left onto the AT, still ascending but on a much more gradual grade and reach Black Rock Overlook in another 0.72 miles. You’ll pass a side trail to Big Meadows Lodge on the right before reaching the overlook. After taking in the view continue north on the AT and in another 0.36 miles arrive at the original junction with Lewis Falls Trail. Retrace your initial steps back to the car. Critique: Lewis Falls trail is a great trail for you or the family as long as you don't go after a storm. Like some others, I too picked a bad time to hike it, right after an ice storm, and many, many trees were down, and it Was a Workout. When trees are cleared, it should be a pleasant hike. If trees are down, there are many trails which will most likely be cleared first. Anyway, Lewis Falls TL starts downhill, and 1.3 miles later, Lewis Falls. Chances are, you'll hear the falls before you see them. There is a nice rock walled lookout to view the falls safely. There is also some nice views looking off towards the west, especially in spring and fall. When leaving Lewis Falls, I recommend taking the longer, (but much easier) hike back, which leads North to the amphitheater area. Unless your in a hurry than simply go back the way you came. All in all a very nice hike and waterfall. Critique: Decided on a pre-Christmas hike to clear my mind. Parked just past Big Meadow and got on AT around the backside of the Big Meadow campground. Turned onto Lewis Falls Trail and was stopped in my tracks. AT was cleared, but not Lewis Falls trail. Took 1.5 hours to make it to the Falls. Severe trail blockage. Don't go!!! Don't take kids! You can't even get to the good side of the falls. One hour back up the trail with more severe blockage. Other than that, nice 3 hours of scrambling over, under and around fallen trees. Some areas I would say are dangerous, as you have to get off trail to get around the trees and the slope is steep. Fell/slipped several times.